Communities and Surface Water Management…Can it happen? In my blog in October 2012, I raised the question of how communities can help deliver surface water management for the LLFA by asking the question of “how can we help?” so what can the LLFA do to help? In Lambeth we have helped residents De-pave their front gardens we have helped a community transform an alley way from a conduit to a place, we are working with residents in Norwood to transform their street and beyond but is there anything else we can do to enable and encourage residents to undertake surface water management in their community or their own properties? At 9:30am on Saturday 12th January 2013, 27 residents, plus two council officers arrived at Root’s and Shoots in Kennington for Small Green Roof workshop organised by Urban Wild Project run by Reset Development. 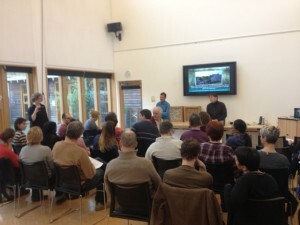 The Workshop was given by John Little and Dusty Gedge. The day is a mixture of simple practical advice and also a practical session where you build a section of a green roof. The day is informal in approach and discussions are wide, varied and interesting and it’s not all about green roofs you also learn about habitat walls. Throughout the day we were joined by David Perkins, wildlife and bee expert, who gave a presentation on the importance of green roofs in the urban environment for Bees and other invertebrates. 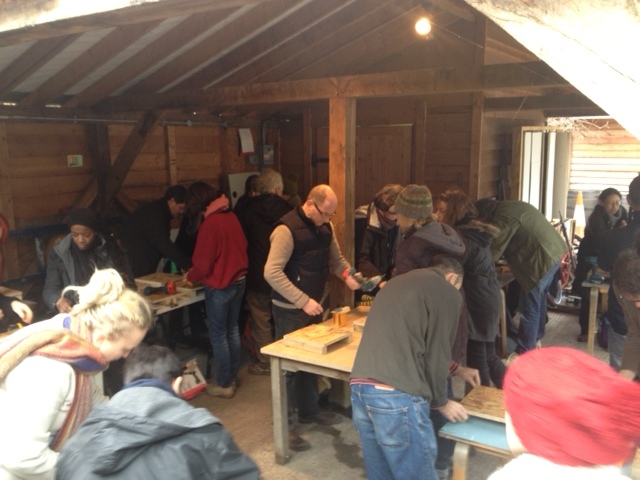 So why should the LLFA fund, support and encourage such a workshop? What benefit will this bring? How can it be measured? The answer is very simple, by empowering, supporting, encouraging and up-skilling residents and community groups allows them to take forward these skills and knowledge to both implement green roofs themselves but also allows residents to challenge development in their community but also allows them to develop their own proposals in their community. As mentioned at the workshop, as the LLFA if ten green roofs are installed in the borough as a result of this workshop then it can be considered extremely successful. We will be looking to fund more of these events moving forward as they are an essential tool in delivering surface water management, with the added bonus of increasing bio-diversity helping toward reducing the heat island effect and also as an extremely efficient building insulator. So what will I be doing as a result of the workshop? Not also will I be encouraging residents to but I have a shed at the end of my garden which will be having a green roof installed very soon.